Managed Rights Media & User Created Content- Birth of a Litigation Underground? Managed rights photo shops, such as Getty Images are bound to protect the rights of photographers, illustrators, and videographers in order to preserve the value of their work. Especially in light of an ever increasing level of choice and quality from the very low cost stock photography sites such as istockphoto.com, they are seeking to offer the professional media producer a reliable way to make sure they’re paid each time their work is used in print, online, and elsewhere. These folks employ a variety of tools, including picscout, to crawl the net looking for unauthorized uses of their work in websites and blogs. Through image recognition and invisible watermark technologies, the crawler seeks out and reports on locations where their photography exists, and then compares the locations to the licenses on file. If a disparity is found, it is reviewed and then action is taken on the website or blog owner. Expensive action sometimes, without a trace of a C&D. I’m certain that at this human-point of the activity there is discretion applied about how to handle it. For those of us managing dozens or even hundreds of sites, it is very, very easy for an unauthorized image or illustration to make its way into a website. While most have absolutely no intention of defrauding the artist or the stock photography shop, some may find a bill in the mail for hundreds or even thousands of dollars showing spider-finds of photographs on websites. For the hundreds of thousands of sites built upon web templates or the packs of 250,000 images for $99.95 on ebay, you could be tagged at any moment. As also pointed out on the Signed Media blog, it’s the era of the era of user-created-content. I have a client using a CMS system to provide websites to over 250 individual users. Other clients edit their sites regularly and post images. These newbie users, despite our best attempts, do not think twice about grabbing an image from another website or from Google Images. 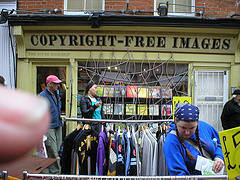 Too often, these are images from a managed rights photography shop. We remove the image as soon as we can, scold the site owner, but it’s a formidable task. We have taken “reasonable steps’ as requested by the DMCA procedures to inform users of the policy. I try to tell them it is the site OWNER who will receive the letter/fees, but that doesn’t always help. They see a kitten, they post the kitten, kitten photographer be damned. If a tool were available to me for scanning sites to compare images to those represented by stock agencies, I would use it regularly. I know photography, illustration, and photography is hard work, and I know producers should be paid for it (while you can.) Just know that not all of us are thieves, despite the letters people get from these companies (they threaten legal action, could they, or need they prove actual harm?) It must be done by hand, which is insanely time consuming. If the agencies set up a site/service that crawled sites and provided a report of any copyright images we could then take action, be it addressing an unpaid license or removing the image. But that would not be very lucrative for the stock agencies and photographers, would it? Hmmmm. The net-net is there’s big money in copyright violations, especially if photos are registered with the copyright office and they are watermarked. What keeps this from becoming a more prominent figure in the industry itself is two-fold: the lack of awareness of how lucrative it can be, and the “resources” available for tracking the infringements in the first place. But, like anything that has the potential for money, there will be those who start down those paths to see where they lead. I wonder if there is a risk of a “lawsuit underground” developing? (if it doesn’t exist already!) What prevents people from taking photos, posting them in very, very high traffic and obvious locations, and registering them at the copyright office. Stir, wait 3 months. Begin suing. Is this realistic or just silly? Dan says it would be short-lived as soon as people picked up on what was going on. I’m seriously doubting this, knowing the social-publishing audience I deal with. Dan also drew my attention to the “Attractive nuisance doctrine” which I’d never heard of – and I can see how this might apply here. As it stands, it could be a new minefield that is being laid by more and more sophisticated tools employed by the stock agencies, the increase in user-created media, and the pinch felt by artists as microstock and low-cost stock shops open. I know I’m missing some great links on this post… stick them in the contents and I’ll integrate them. PS: I’m no lawyer. this is not legal advice. you should know that. Postscript: Righthaven LLC was shown to be practicing a very similar approach to sue-first, settle-later to small blogs in 2011. They are being dismantled in some ways by legal rulings against their mode of operation. I’ve not researched it carefully, so you should dig deeply if truly interested. Postscript: I found that these attorneys are targeting this with their practice. Some of the documents they have are very interesting. Update: Google enhances presentation of photographer/license metadata in Google Images.